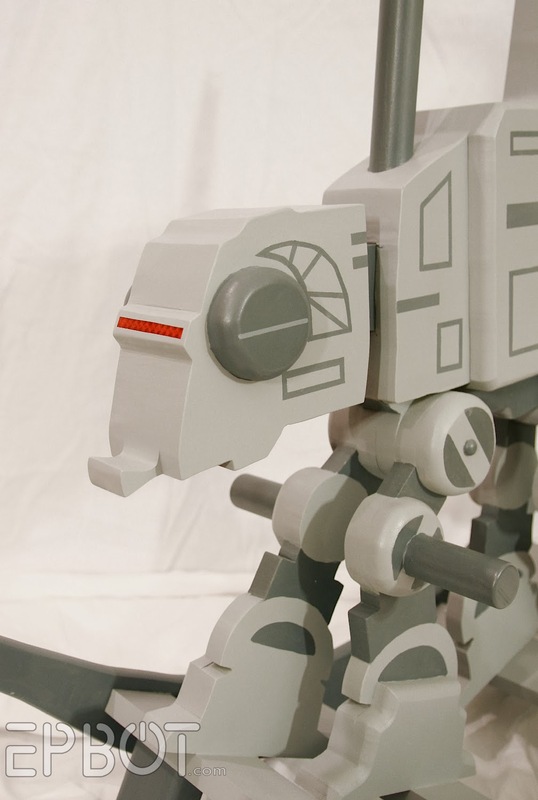 EPBOT: Finished AT-AT Rocker Reveal! 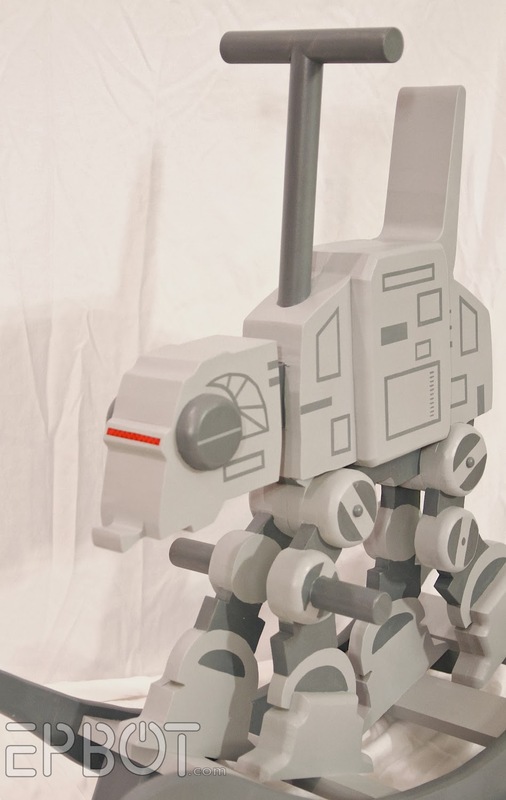 As I said in my last update, painting the AT-AT rocker was the hardest part for me - just figuring out how much detail to include, and how to simplify the lines to make it a little cuter. The rail bumpers might not be necessary for an older and/or more adventurous child, but our 4-year-old test subject Isaiah was afraid of rocking backward, so the stops helped him feel more secure. The bumpers are glued on with construction adhesive, so they're quite strong, but in the future they can be popped off with a hammer. There's our brave little Sith! And finally, here's the funny part: I have no idea what to do with this now. I'm sure I'll have plenty of folks volunteering to take it off my hands, but the thing weighs a ton and would be a huge pain to ship. I'm thinking I might ask the local 501st if they'd like to auction it off at MegaCon later this month, so the proceeds can go to charity. So, if any of you have a contact at the Orlando 501st I can ask - or a better idea of where this might do the most good - just lemme know in the comments, k? Yay! Congratulations on winning the give-away you guys!! Jen, the rocker looks AWSOME! Holy cow. This is amazing! Great job!!!! Wow, that looks beautiful! So much detail...so much hard work...so much time spent...and you didn't even have a recipient already in mind?! 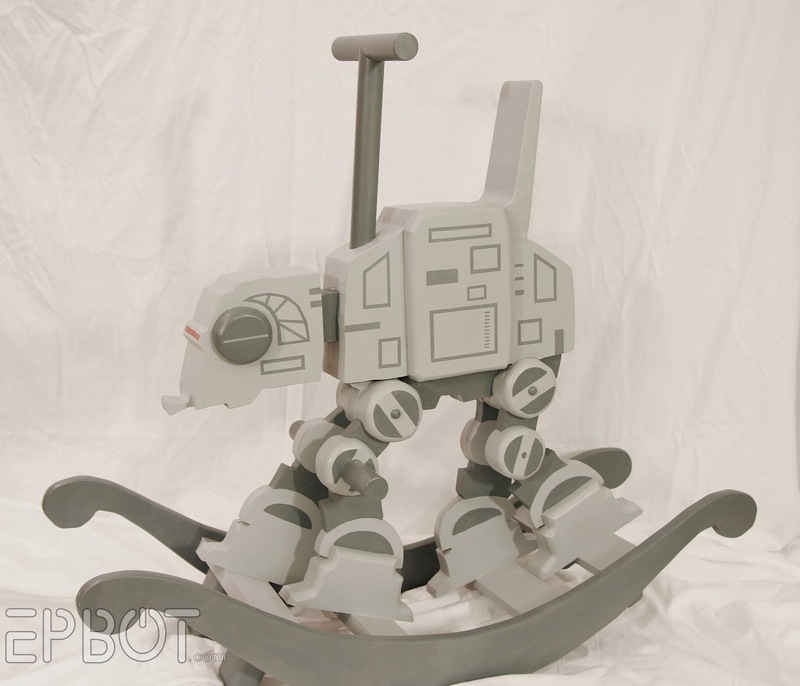 You made an AT-AT rocker just for the sheer pleasure of making an AT-AT rocker? I can't even imagine having that kind of ambition! It's sure going to make a killing for some lucky charity(ies). You two are wonderful, generous people! You are a woman after my own heart Jen. This is why I need to set up an etsy site: that jewelry isn't going to get rid if itself! It looks great. But would it benefit from a seat cushion? It's actually pretty comfy as-is - this from Isaiah's mother, who is tiny enough to sit in the thing herself. Ha! I've been waiting to see the little guy on the rocker, as you told us a long time ago that's what we would see. Did not disappoint!! LOVE the pic of him on the rocker. Proving, once again, (not that we needed further proof) that you and John R-O-C-K!!!!!! That is the most wonderful thing ever! Ever I say! I love that you're willing to give it up for charity. And YAY ISAIAH for being brave enough to ride the wild at-at! I think auctioning it for charity is a great idea and as always - looks amazing! I do! I work with a member of the orlando 501st! I will send him an email later! i came over here to congratulate you on a job so well done, but then see my name on the bottom as a winner of your art giveaway? squeeeeeeeeeeeeeeeeeeeee! thank you, thank you. way to make monday rock! Charity is an awesome option! Wish it would go up for auction here in Canada, would look great in our geek filled nursery. Squee!!! Oh my gosh, that thing is the amazing-est rocker ever! You did a fantastic job! The amount of detail is just perfect. And kudos to Isaiah for getting brave enough to ride it. Congrats on an awesome job well done. Really fantastic work, Jen. My 5 year old star wars fan thinks it is awesome. I think you are for donating it to charity. I hope they put the auction online! I looooooooooove how this came out so much I could just melt! It's adorable! Also, I think it's incredibly wonderful of you guys to think of donating it to raise charity money. I hope that it all works out and lots of money can be raised! =D You guys are so awesome! Ooh, I think an action is a great idea! Have you tried tweeting the 501st (@501stLegion)? Maybe they can help. This...this is epic. It's been fun following along with your progress posts, and the finished product is fantastic! We have a rocking horse which my kids love, but this is the next level for sure. I bet you could contact your local 501st through Facebook. I know mine has a FB page. Thanks for sharing this project with us! Great job with the AT AT! And congrats to all the winters! I live across the country and I LOVE this rocker, but yes absolutely. Auction with the 501st- that is a fantastic idea! That looks so great, Jen! I may ask my father-in-law to make one for our little boy on the way! Update, he's due in about 6 weeks! Holy childbirth, Batman! Yep, that close. Wish me luck! Super cool concept, but I still think it's way too tall to be safe. I thought so before and now that I see a 4yo can't reach the ground while seated I am sure. It it was teeny hair shorter it would be much, much safer. It's so cute! 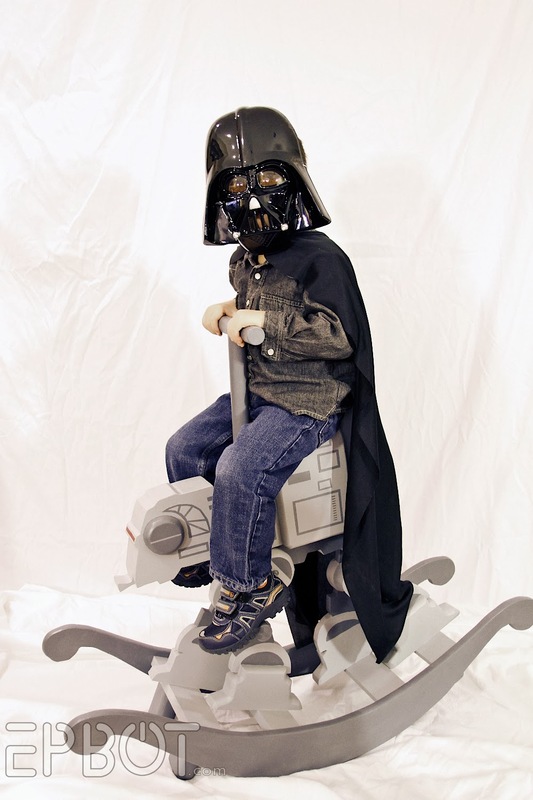 If I ever adopt a kiddie, I'd be all about having something like this for them. Requesting a picture of one of your cats on it. You will then "win the internet". -Melissa R.
Love the rocker, it came out great. Ok, that being said, artistically, I think that a thin line painted between the edge of the At-At body and the seat would help separate them. To me it would make it look more "finished". Totally amazing and so creative. Job well done! 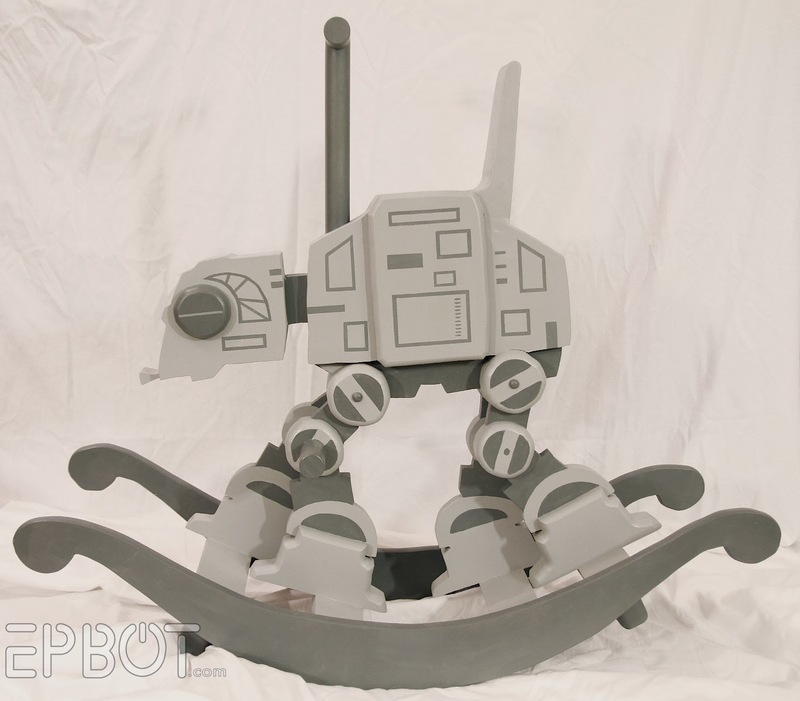 That's a great rocker, and I like the look of it, but considering it's an AT-AT how do keep it from falling over and exploding? It is fantastic no doubt about it. Time to download those instructions and have a crack at it. Well done!